They key to getting PR is to actually pitch the media. Chances are, you have several brilliant ideas of why Good Morning America or Inc. Magazine should feature you or your business. All you need to do is tell them about it. They key to that is simple planning. If you haven't pitched the media in the last 30 days, then you should listen to this Training TuneUp: "Breaking Through PR Blockage". Most importantly, you need to plot out your ideas and tick them off one by one each time you pitch. 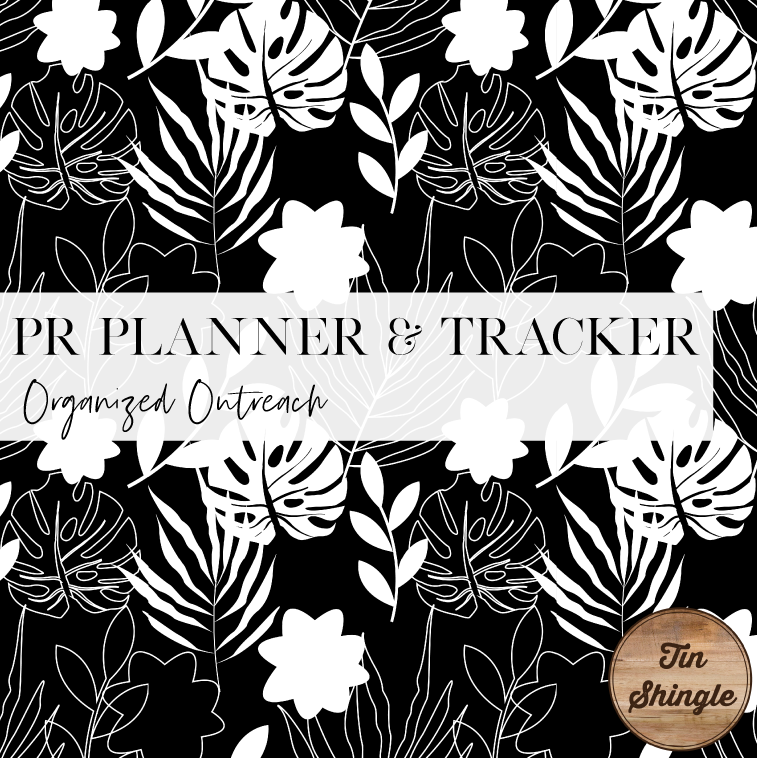 Easiest way to do that is to plot your ideas in Tin Shingle's newest template, the "PR Planner & Tracker for Media Outreach". In one place, see your plans for when you want to pitch a print magazine like Entrepreneur, and what you want to be pitching blogs or local TV. Because these media types work in different cycles, the content will vary drastically. TV and blogs may be working on Summer subjects, but print magazines are working on Fall and Winter subjects. Keep things straight on this at-a-glance sheet. Once you have your at-a-glance plans down, go into specifics on the idea sheets for each media outlet type. Track your ideas for magazines on one sheet, and your ideas for bloggers on another. Input your intended Media Contacts right there, and a column for if you pitched that idea or not. Individual idea sheets are color coordinated with the At-A-Glance Media Landscape. Pitching the media can become a game of numbers. The more you pitch, the more your chances increase of getting picked up. 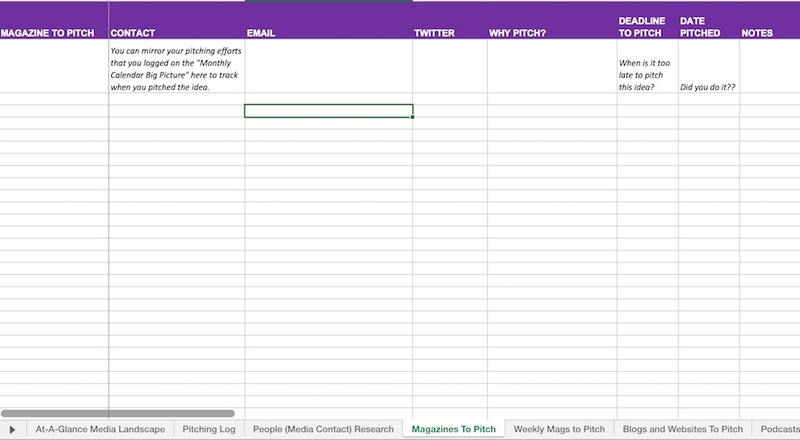 Track each time you pitch and followup in one sheet - the Pitching Log. When you pitch the media, you often won't hear back from them. That's OK. But the silence can hurt. Remove this per-occupation by pitching several different media outlets, and following up with them. When you begin pitching a lot, you won't think about who didn't get back to you and why. They will simply be in your rotation of who you want to pitch when. The At-A-Glance Media Landscape will help you get your big picture view of what you should be focusing on for each month. Detail your pitching plans in dedicated worksheets for each media outlet. Shown here is the "Magazines to Pitch" worksheet. Put your intended magazine contacts and ideas for them here. Tracking writers as they move around is very important. You can do that from a worksheet in Tin Shingle's PR Planner & Tracker. Contributing Writers are looking for content for several magazines at once. A writer may be a very good fit for your brand. You'll want your business to be top-of-mind for when they need to highlight a product or seek advice from an expert. Buy It: Purchase it here and have Forever Access as we make updates to it. Simply download the latest version. Get it for Free: All Access Pass Level 4 Members of Tin Shingle get this planner for free. Learn about membership here. You're doing a great job of networking and getting the word out there, and new clients are signup up for new retainers and special projects! Life is getting busier, and you need to contain it. You'll want to stay ahead of the client work to keep those clients happy, but also to prevent anything from slipping through the cracks, as well as not working too much because you didn't realize just how much you were working for a client, and actually blew past their budgeted hours they purchased from you. Introducing...The Client Time Tracker Template! There are a bazillion project management softwares and templates out there. We've tried a few, and to be honest, are happier in Excel spreadsheets that can be accessed at the tips of our fingers via Google Docs/Drive. Sounds nerdy, but they really can be very simple, non-obtrusive, and a perfect place to contain your brain. 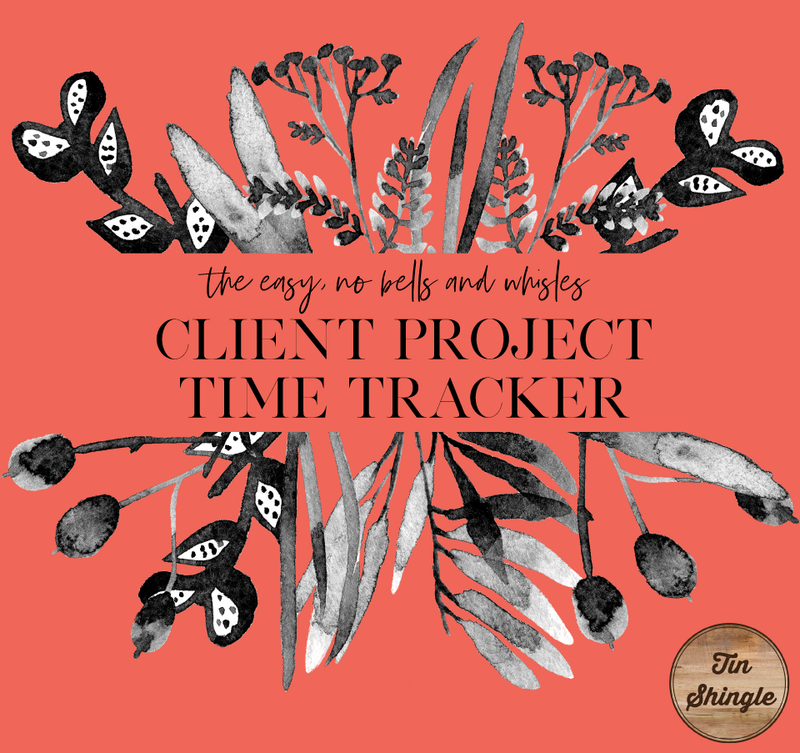 Recently, someone asked for "an easy, no bells and whistles client project tracker." This template is just that - an organized place to store what you're doing for a client, who on your team is doing it, your cash flow for paying your team, and future ideas for your client so that you can keep the work flowing forward smoothly. Each client is on a worksheet, and within that, is separated by project, depending on if they pay you per project or monthly retainer. What did you do when? Easily chart it in the line items. If you desire, copy/paste those line items into a Status Report you will send your client (you're sending those...right?). Different contractors may have different rates with you. Or the same contractor might have a different rate for different work completed. There's a place to track that in this template. Those contractors are on it like bonnets, and have submitted invoices to you. How much money is in the bank to pay them? There's a place to track that in this template. We highly recommend you to send your clients monthly or project status reports. A color-coded system is in place to help you see when you've communicated or not to your client. Client Love is important! Once purchased, you get lifetime access to any updates made to the file. GAH! No Wonder I'm So Tired and Broke - I Worked Too Much For A Client! We've gotten this text message before from friends who don't track their time in an easy system for them to access, and they just work and work and work. #werkwerkwerk like that is no fun. When you reach the end of a project, or almost the end of it, you can inform your client, and prompt them into action for purchasing a new set of hours, or keeping their monthly retainer! Good news! 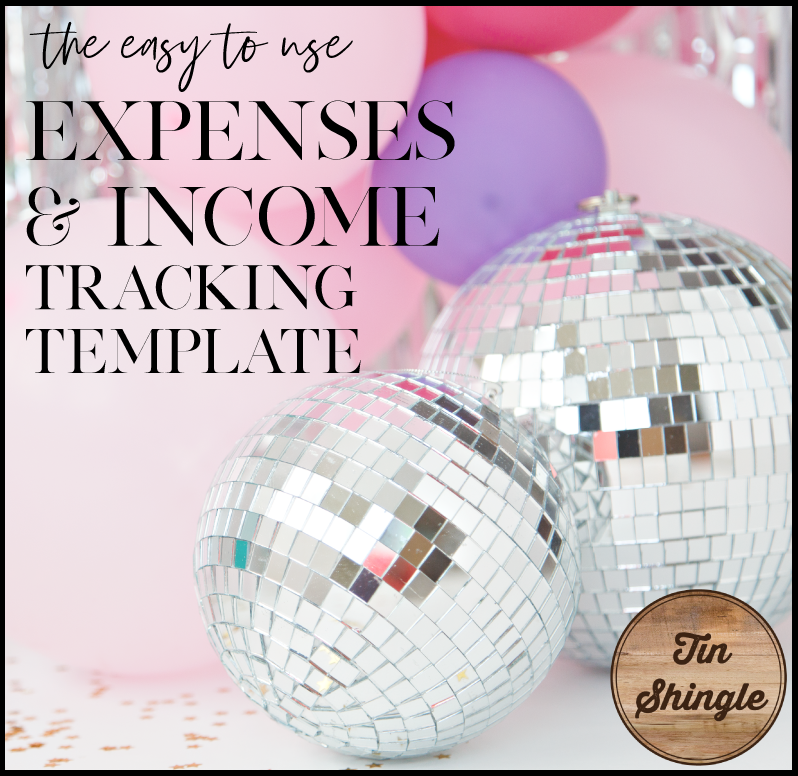 This template is free with an All Access Pass to Tin Shingle's Membership! Or you can purchase it individually and keep it in your personal selection. Any updates or enhancements made to this template are made available to you for free.